I hope you'll forgive me for doing this issue of Moondancing a bit differently, this week. On the day the last issue went out, May 22 – I lost my dear old Dad. It’s been hard. Yet I'm aware... like any change that leaves a space inside, it's also part of life. And I know too, that I am lucky to have had him for so long. I spoke at his funeral and that was hard, too. But when I arrived home, I wearily wandered into my small back yard to be closer to the earth. To my surprise, I discovered my first flowers of the season. 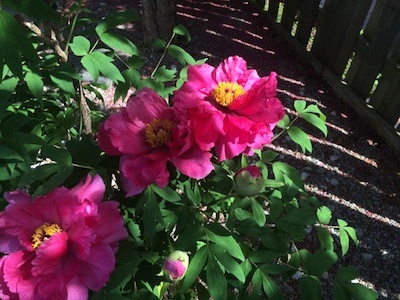 These three massive peony blooms, bursting with life! More these days... it's not loss that most often brings me to tears. It's not change, it's not the unexpected and it's not disappointment that I didn't get what I want. What brings me to tears is when we choose to see the life, despite it all.